We are delighted to announce that “ExpressCare” minor injury and illnesses clinic is to become the main sponsor of the year-round ITRA Tag Rugby leagues in Cork. As part of the sponsorship package, the ExpressCare logo will feature on all referee jerseys, balls and tags used in Cork leagues, while important information about the state-of-the-art services at ExpressCare will be available to all Cork tag rugby players at the various participating grounds. With venues in Cork Con FC, Garryduff Sports Centre and Irish Independent Park over New Year, Spring, Summer, Late Summer, Autumn and Winter seasons, more than 2,300 taggers play in ITRA’s Cork leagues each year and, with a number of new initiatives being rolled out in 2019, including New to Tag coaching sessions aimed at beginner players and Novice Leagues for start-up teams, numbers are expected to continue to grow. We’re delighted to welcome ExpressCare on board as a sponsor and are looking forward to working with them to develop and grow ITRA Tag Rugby in Cork. 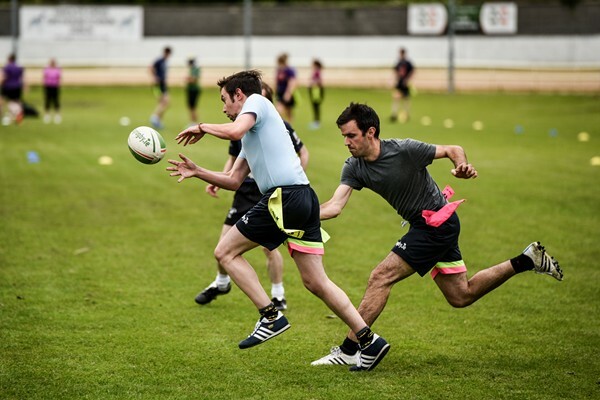 We’re excited to partner with ITRA Tag Rugby in Cork and tell the Cork tag community all about our world-class walk-in clinic at The Elysian, which is open every evening until 10pm, allowing players who get injured during a tag match to be seen quickly and efficiently by ExpressCare staff. It’s fantastic that ExpressCare is partnering with ITRA Tag Rugby in Cork for the next two years. I’m really looking forward to popping my head into all the venues over the year to watch some exciting tag action. ExpressCare Minor Injuries & Illnesses Walk-In Clinics are open to everyone from 10am to 10pm, 365 days a year, in Cork and Dublin, to offer an alternative destination to busy emergency departments and significantly relieve the burden on busy A&Es. Promising fast turnaround times with no appointment or referral needed, ExpressCare is staffed with Emergency Department trained doctors and A&E nurses who care for minor injuries such as fractures and sprains or cuts requiring stitches. ExpressCare aims to see patients within a one-hour turnaround time and children over one-year of age can attend. Patients are often referred to hospitals due to difficulty accessing diagnostic services, but ExpressCare offers rapid access. As Ireland’s leading diagnostic imaging provider with a network of 12 clinics across Ireland, Affidea provides X-rays, MRI, Ultrasound, CT and DXA scans in flagship scanning centres located onsite. ExpressCare offers a complete patient pathway and has on-site consultant clinics, in disciplines such as orthopaedics and plastic surgery, offering weekly clinics to follow up on any more serious injuries. ExpressCare operates independently providing services to all patients who attend on a fee-for-service basis or, alternatively for patients with private health insurance with Laya Healthcare and Irish Life Health, ExpressCare is a covered benefit. They also offer a €50 discount for patients who present with a GP referral letter. For more details, visit www.affidea.ie or follow @AffideaIreland on Twitter and Facebook. Founded in 2000, ITRA Tag Rugby is an ever-growing sport in Ireland – there are now over 22,000 male and female players in Dublin, Cork, Limerick, Galway, Naas and Ennis with 96% aged between 21 and 35. ITRA also organises a number of hugely popular one day festival events during the summer, including Tagtastic, Corporate Cup and Banna Beach Tag. Numbers are expected to increase significantly over the coming years as ITRA, in association with the University of Limerick, has been awarded the 2021 Tag World Cup, when 3,000 tag players from 20+ countries will travel to the Treaty City of Limerick in August 2021. You can register a team with friends or work mates – or, if you are on your own, we can find you a fun, social team with other individual players. For more info, go to www.tagrugby.ie or call 01 2020100.